By the end of the 1860s, the 1850 gaol was too small. 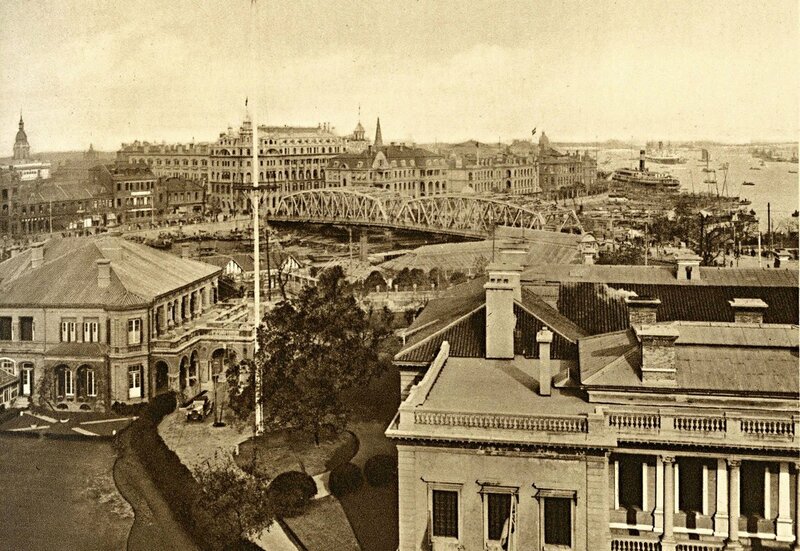 A new site of about four acres between Amoy Road and Soochow Creek was bought by Crossman in 1868 and a large new gaol with 82 cells and staff quarters, workshops and stores was completed on it in 1871. By 1900, the number of miscreants had dropped – mainly because steamers remained in port for only short periods and did not allow their crews ashore – and since only about twelve of the 82 cells were in regular use, a large part of the prison was leased to the municipality for its own use. It bought the whole prison in 1925, with a covenant to look after the relatively few British prisoners in accordance with forty pages of agreed regulations. In 1868 a strip of land next to the old gaol was granted to the Royal Asiatic Society for building a library, museum and lecture room: the Society remains on this site. 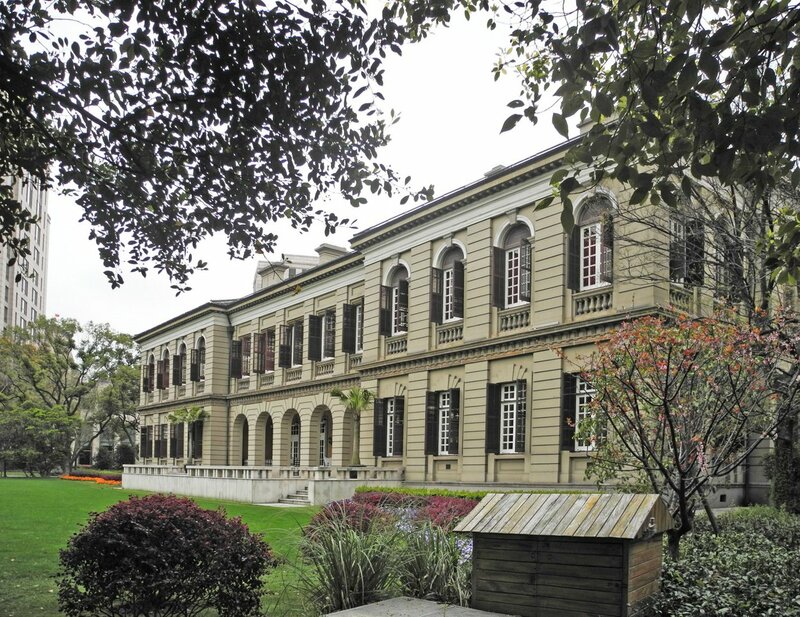 Some land was leased to the Shanghai Rowing Club from 1903 for the construction of a new boathouse, designed by Scott and Carter. It had a central two-storey brick building with a long flank building on either side facing the Creek: one was the boathouse, the other an indoor swimming pool. 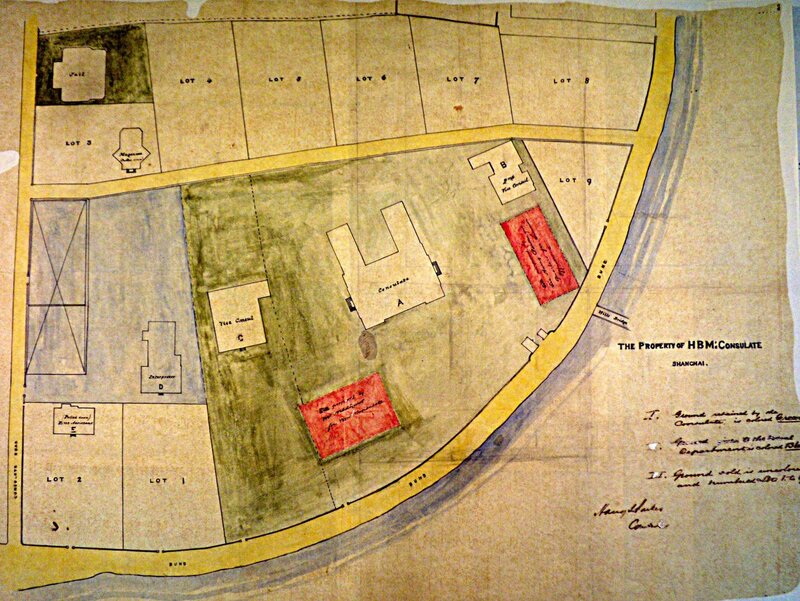 Compound plan of early-1860s, showing nine Lots sold in 1862. 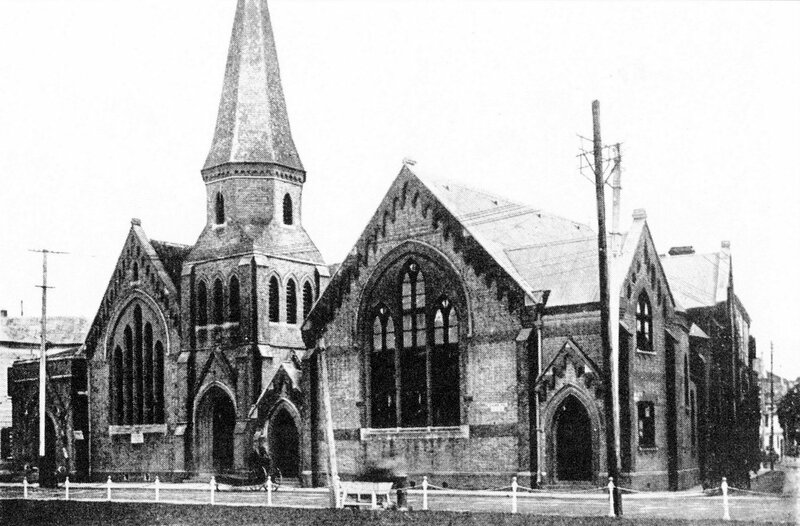 The Union Church, 1886, with hall on the right, 1901. The Royal Asiatic Society Building, built 1870s. Looking down on the Rowing Club, with its associated boathouse and swimming pool, towards mouth of Suchow Creek. The restored central portion of the Rowing Club, 2013. View of compound, looking north, 1934. 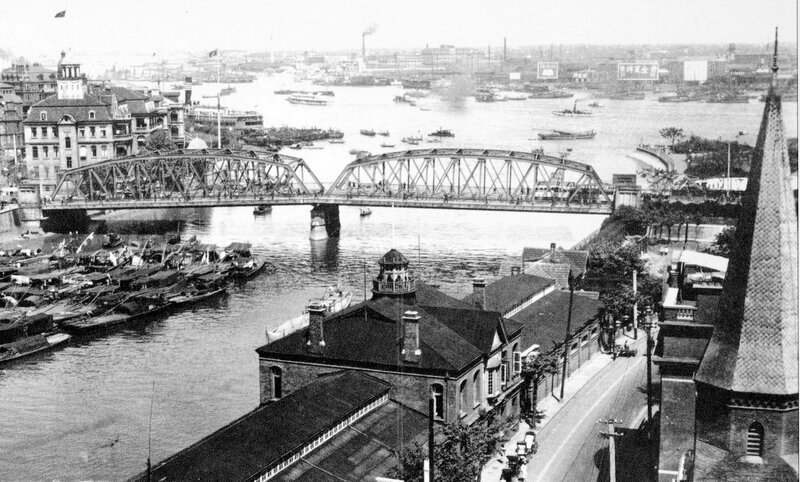 The embassy moved to Shanghai in December 1937, when the Japanese occupied Nanking, and the chancery remained there in theory until December 1941 when the Pacific war began. 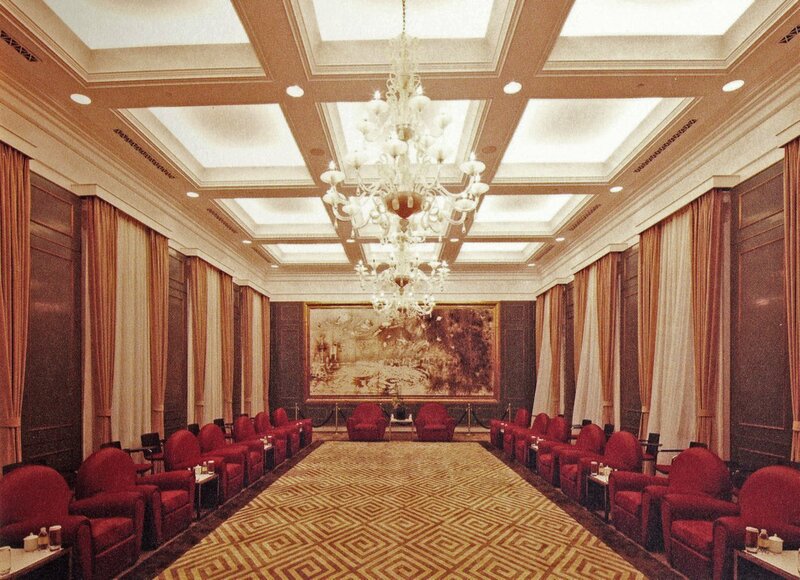 In practice, the ambassador left Shanghai before then, first to Hankow and then to Chungking, where the embassy remained with the Chinese government until 1945. The consulate-general closed upon Japanese occupation of the International Settlement on 8 December 1941. In 1943, Britain surrendered all its remaining concession rights in China and abolished the Supreme Court. 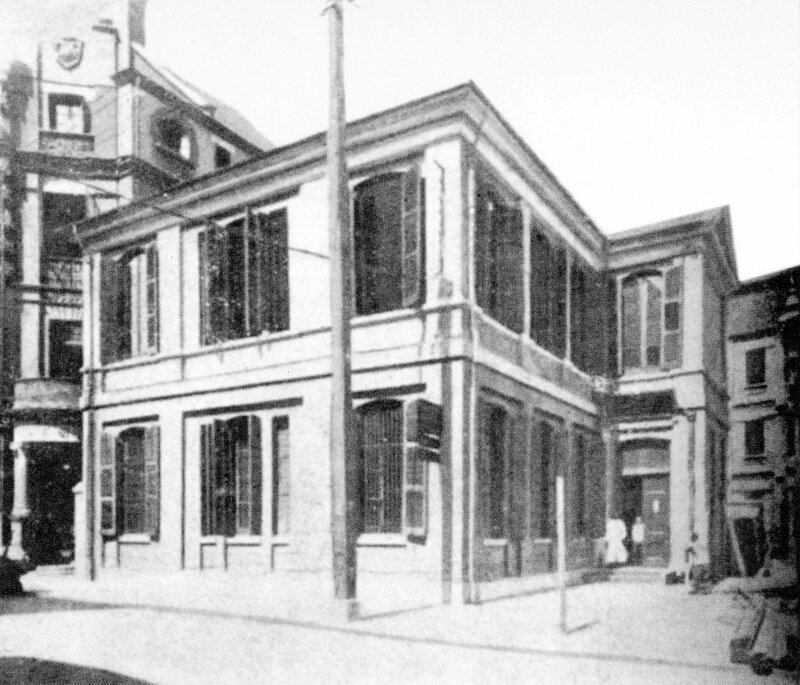 The consulate-general re-opened in September 1945. The People’s Republic was proclaimed in October 1949. There was less and less for a consulate to do and the consul-general was withdrawn from Shanghai in June 1957. The British Ministry of Works moved its Far East Regional Office from Shanghai to Hong Kong in 1950. 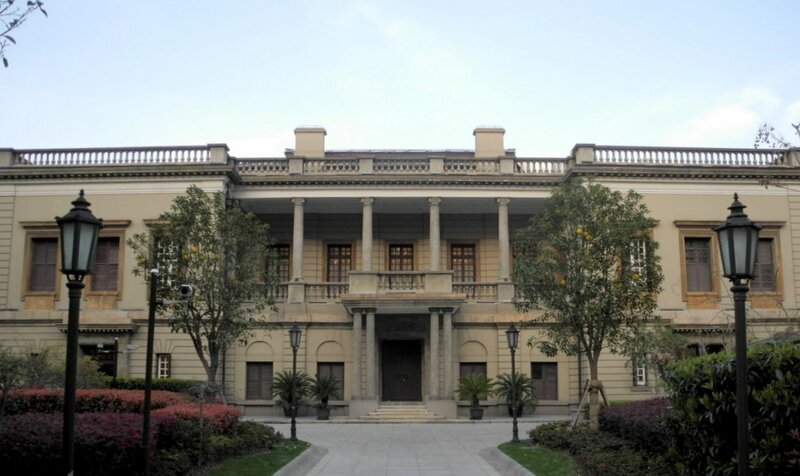 A few consular staff remained, and a counsellor visited periodically from Beijing, but the residence was unoccupied after 1950. 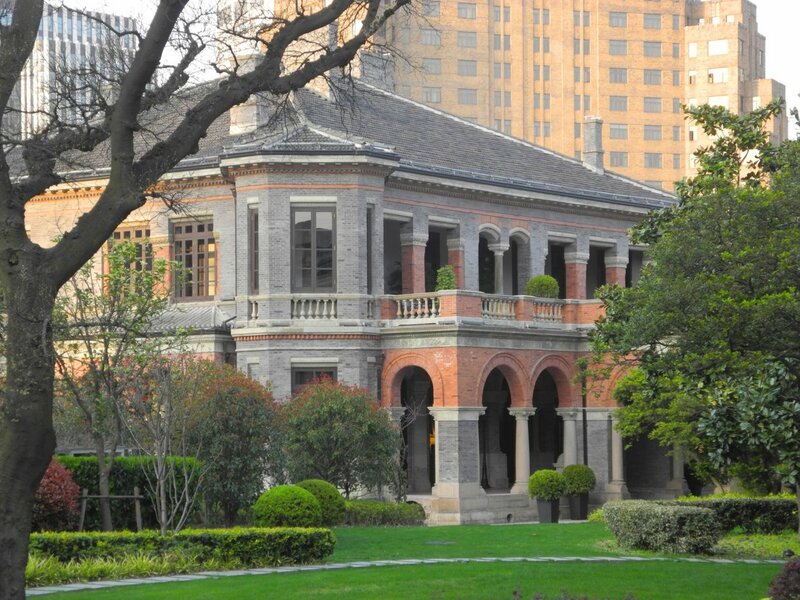 The consulate closed, the last in China to do so, in 1958. 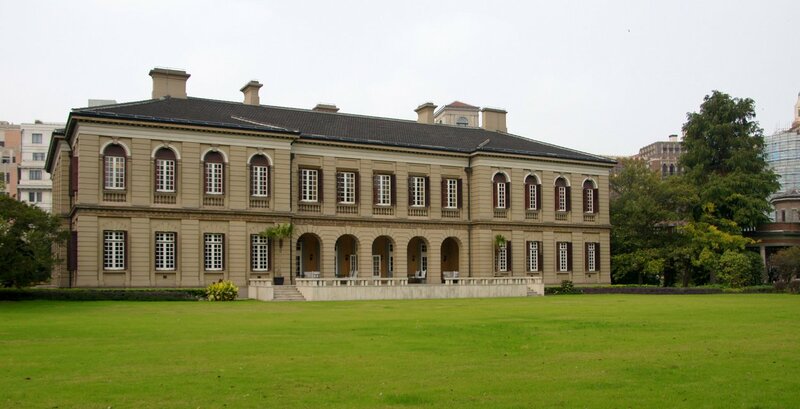 The British government continued to maintain the compound buildings and grounds, with a local staff of 37 guards, groundsmen and cleaners, until soon the start of the Cultural Revolution , when all staff were given notice and pensioned off in 1967 by the embassy in Beijing. The Chinese requisitioned the compound later that year. 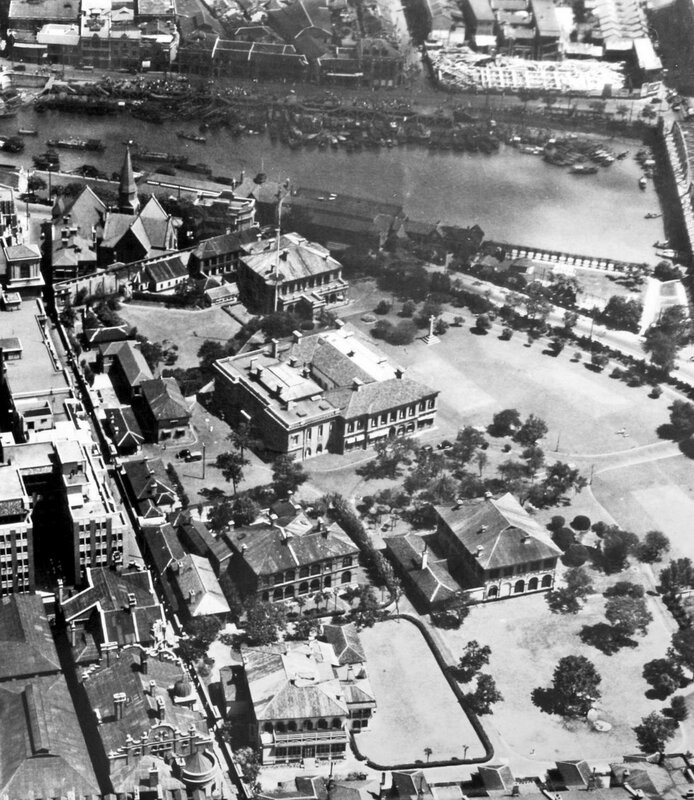 The flagstaff between the residence, on the left, and the offices, on the right, 1933. View across the compound from the north, (note Union Church has lost its spire), 1989. East front of former offices/Supreme Court, 2013. Rebuilt Union Church, beyond residence, 2013. Main building from north-east, with Peninsular Hotel beyond, 2013. West/entrance front of main building, 2013. The former residence, from south-west, 2013. 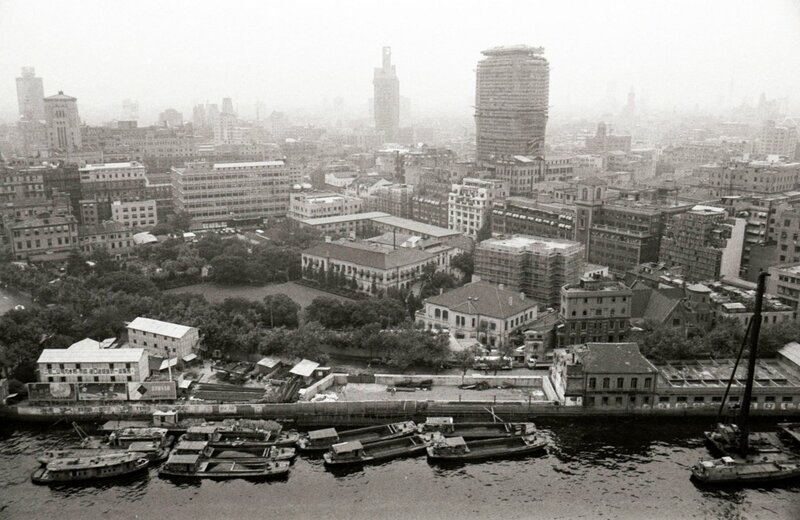 By 1973, some of the buildings were being used as a seaman’s club and Friendship Store and, as time went by, as offices for various Shanghai government bodies. At some juncture, the residence was painted white. The railings were boarded up [?true] and it was difficult to see what, if anything, was going on. Access was almost impossible. 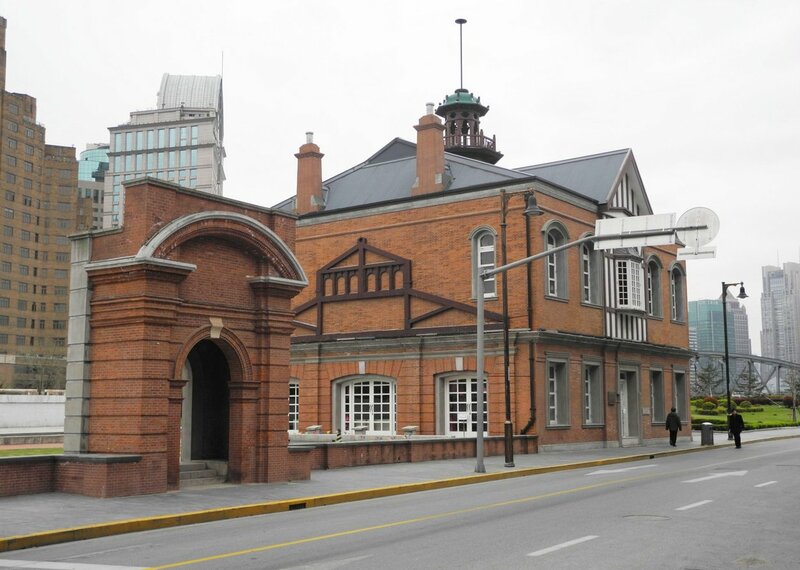 The buildings in the former compound received little attention from the Chinese authorities during the 1990s (though at some juncture [?when] a well detailed and carefully built covered walkway was constructed between the two main buildings]. In [?] 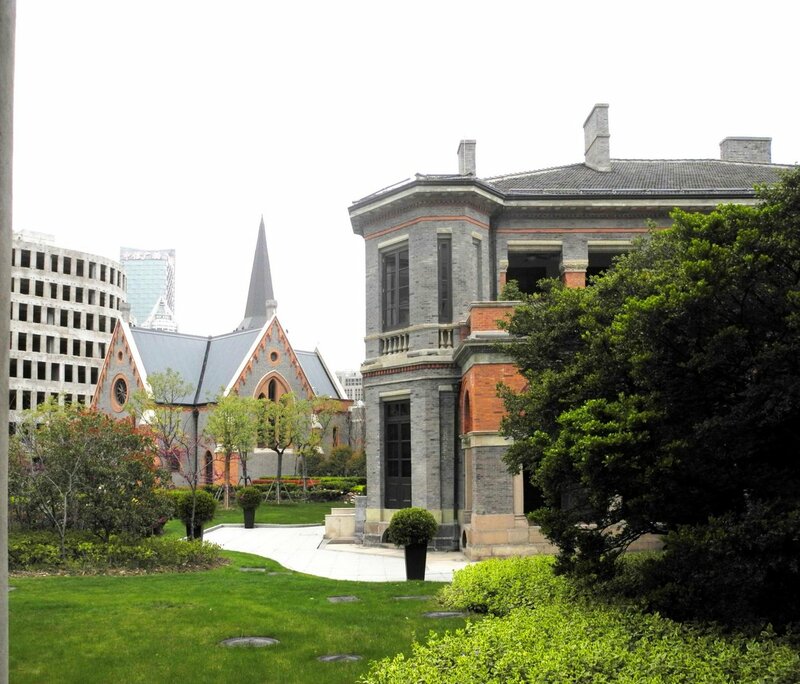 2003, the city authorities established the Waitanyuan project to revitalise the whole area around the former compound and, as part of it, to restore the two main buildings. The daycare centre that by then occupied the old residence was closed, and the white paint stripped off the brickwork. The Union Church building, which had suffered various severe damages, has been rebuilt. 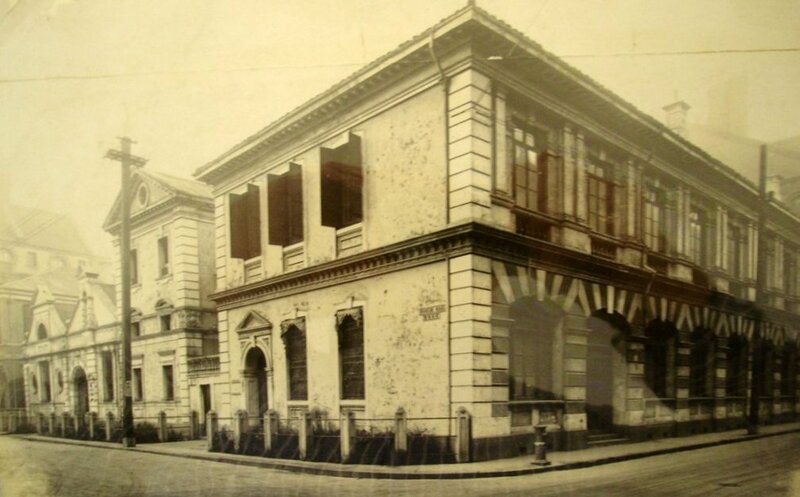 In 2008, the surviving 1849 vice-consul house was demolished to enable the construction of the Peninsular Hotel. 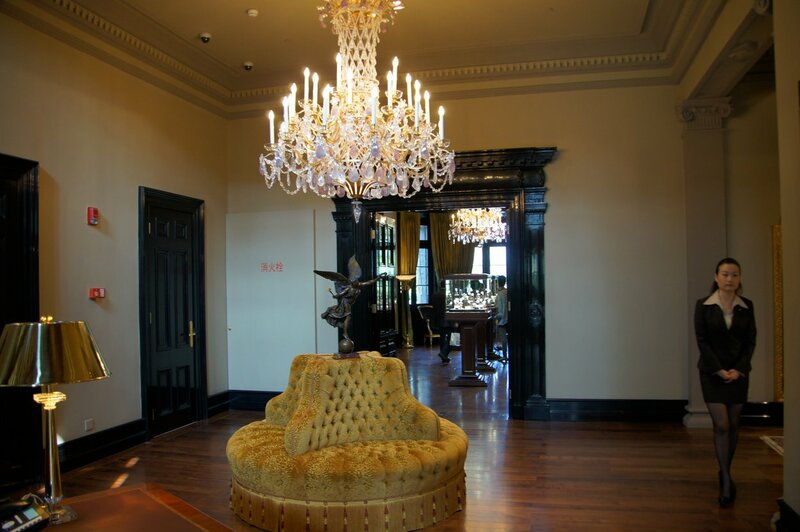 The former offices /Court building has been immaculately restored and adapted as an important venue, named No.1 Waitanyuan, for meetings and events, managed by the Peninsular Hotel. In 2012, Patek Philippe completed its restoration of the residence and opened it as their major showroom in China for its expensive watches. Handsome heritage plaques on the restored buildings explain their backgrounds (with varying degrees of accuracy). 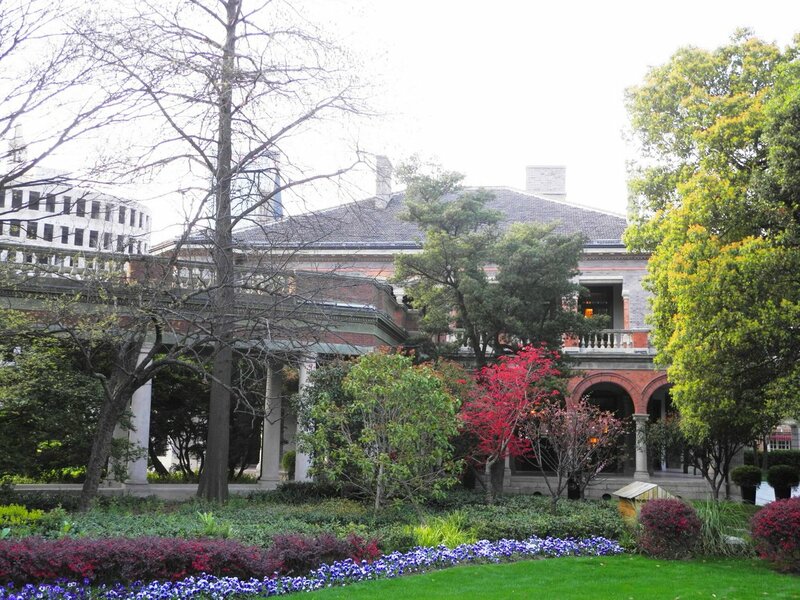 With rapprochement between Britain and China in 1984, a consulate-general was re-established in Shanghai in February 1985, with Trevor Mound as the incumbent. The premises were in a leased property at 200 Yongfu Road [check], now the Yongfoo Elite restaurant. They moved into the West Tower of the Shanghai Centre in [? 2000], and [?] in [?]. I am indebted to Peter Hibbard, author of The Bund Shanghai (Odyssey, 2008), and to Rosy Gao Hong, Patek Philippe’s Country Manager for China, for their help with this page. The former hall of the residence, now the Patek Philippe showroom entrance, 2013. 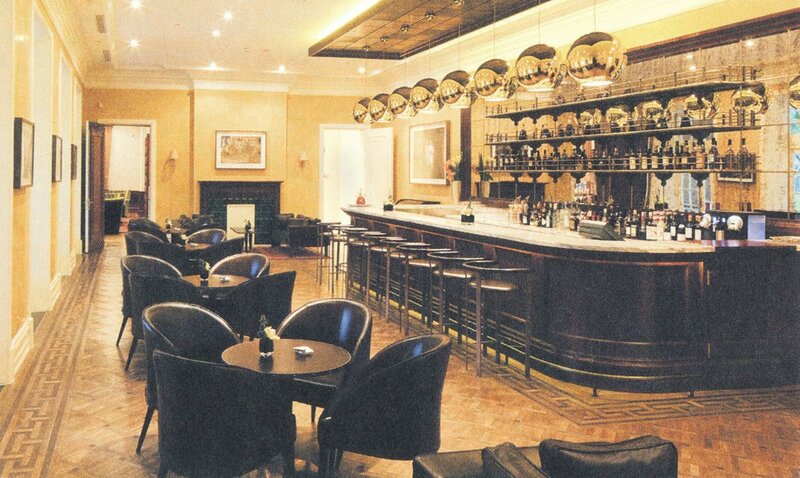 The present Garden Room, formerly occupied by the Supreme Court clerk and the strong room, 2012. The present Grand Hall, formerly the Supreme Courtroom, 2012.